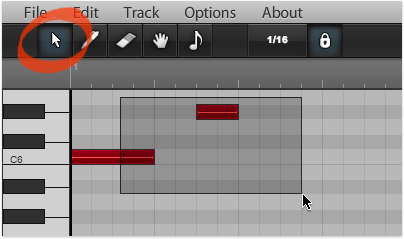 The Piano Roll Editor shows the notes of the song as colored blocks in a time grid. A piano keyboard along the left side of the view provides a reference point for the notes. Before you can edit notes, you must select them. Use Selection tool to make a marquee selection by dragging with your mouse. 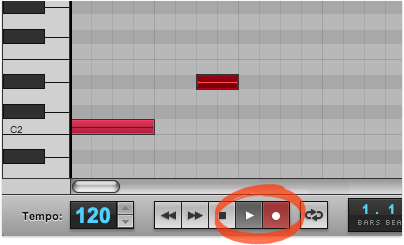 Select single note by clicking or use shift-clicking to select multiple notes. 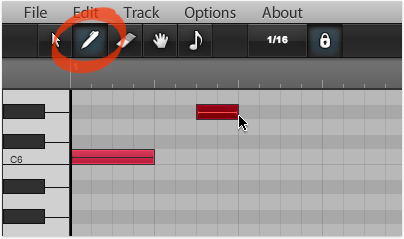 Use the Pencil tool to add notes to your track. 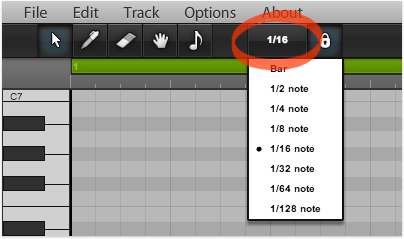 You can also select, move and alter the length of notes with the Pencil tool. When you add notes using the Pencil tool, you can edit the note's length simply by dragging left and right with the mouse button pressed down. 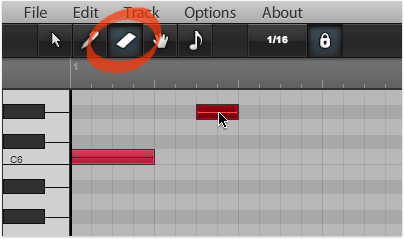 Use the Eraser tool to remove notes from the track. Simply select the eraser tool and click the note with your mouse to erase a it. Use the Note Edit tool to edit the velocity value of a note. Select the Note Edit tool and drag the note vertically with your mouse. When you click the note, a help tooltip will indicate the velocity value, with the value changing as you drag up and down. 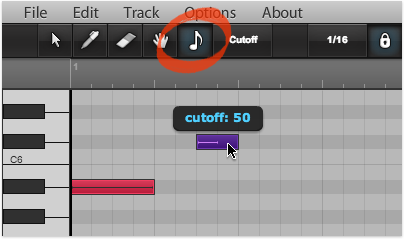 Use the Note Edit tool to edit the cutoff value of a note. Select the Note Edit tool and drag the note vertically with your mouse. When you click the note, a help tooltip will indicate the cutoff value, with the value changing as you drag up and down. 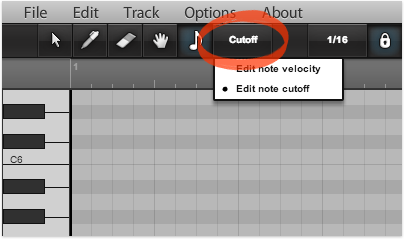 The Note Edit tool features two main modes, Edit note velocity and Edit note cutoff. You change the mode by selecting it from the mode menu. By pressing down the record button, the notes played with the computer keyboard will be added to the track step-by-step, each note following the next. 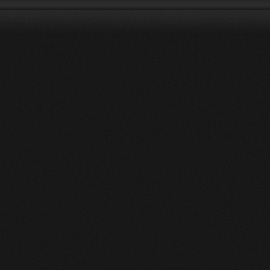 You can adjust the step size from the Snap size menu. So to record 1/16 notes simply select 1/16 from the menu and make sure the Snap button is pressed down. You can record notes live as the song is playing. To record notes, simply press down the play and record buttons, and everything will be recorded to the selected track. The notes can be quantized as you record by toggling the Snap button on the tool bar. For example, select 1/32 from the Snap size menu to quantize everything you play to 1/32 notes.